Click the thumbnails below for additional images. It was also the wall colors that glowed so pleasantly in the light from all those windows: sage green, warm cream, caramel, a rich medium blue. And it was the generous space in the new offices. And the long views from the big windows. And the cozy lounges. And, of course, the “tokonoma” in the Asian studies common space on the second floor — tokonoma being the Japanese term for a recessed display area for artistic valuables. 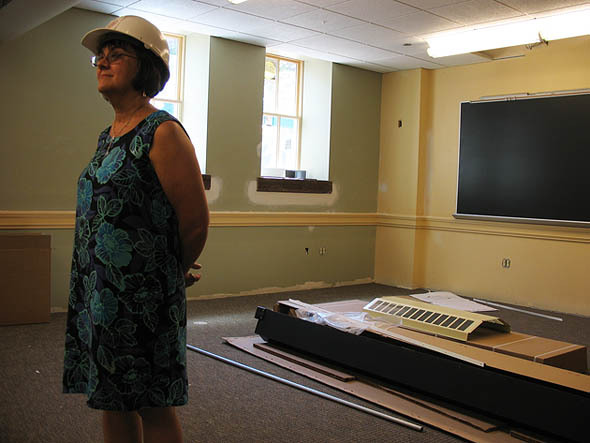 In short, the few staffers and faculty from Off-Campus Study and the foreign language departments who toured the renovated Roger Williams Hall on July 7 were glowing right along with the wall paint, delighted by the many improvements, aesthetic and functional, over their previous quarters. The tour was a prelude to moving day on July 25, when offices were turned over to the Bill’s 27 occupants. 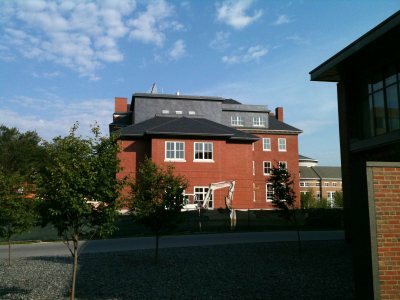 In an arrangement similar to what Bates and general contractor Wright-Ryan Construction worked out for Hedge Hall, which opened to occupants on June 27, Bates has assumed operational control of the building while the contractor continues its work. Of which there ain’t much, at least inside. 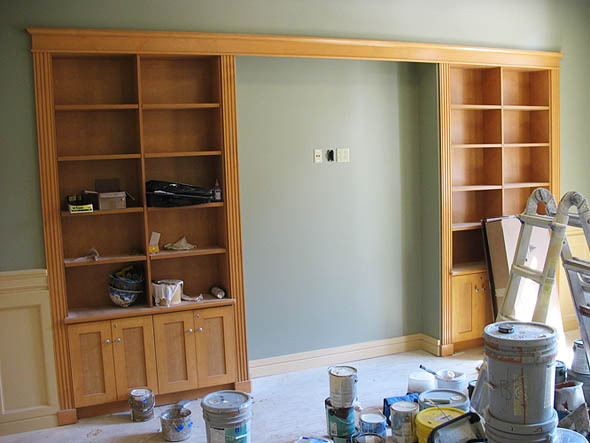 “The places where furniture goes are done,” project manager Paul Farnsworth reported on July 21. 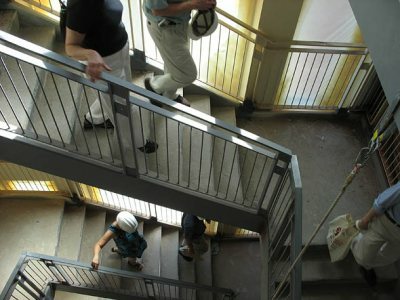 “The last thing that we’re doing is touch-up paint on the handrails in Stair Two,” the stairway in the new section of the building. The end game for the Bill differs in significant ways from Hedge’s. Both buildings are undergoing punch-list inspections and corrections. But at Hedge, in order to shift workers over to the Bill as soon as possible, that process began only after most other work was complete. 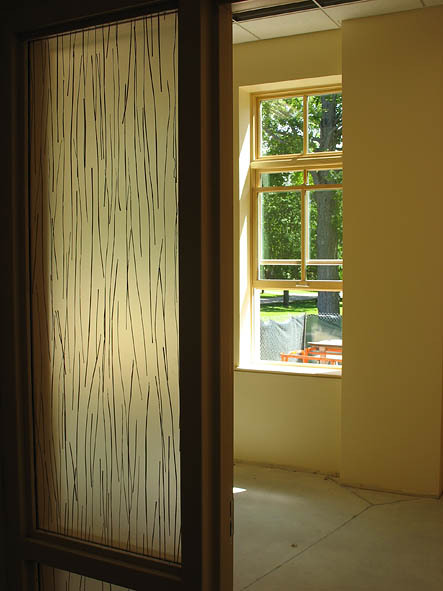 At Roger Williams, they’ve been working on punch lists as they’ve gone along, so they’re ahead of the game. The Bill has also been faster because of its configuration. Its ceilings are higher, which makes some tasks easier to do. And while its footprint is close to square, Hedge’s is long and skinny, which both constricts the space for people to work in and, crucially, enforces stricter adherence to the building plans. Outside the Bill, workers poured a substantial set of steps leading from the stair tower to the Library Quad, and graded the area near the Evelyn Minard Phillips Remembrance Garden. With new grass already sprouting on the side of Roger Bill facing Pettengill Hall, the remaining loam and grass seed should be spread by the end of July. Finally, 17 months after it appeared, the fence around the construction site was taken down on July 20. We walked by one day and it took a few minutes to figure out what was missing. And when we finally did realize that the thing we were missing was an obstructed view, we took it as a signal from the heavens. 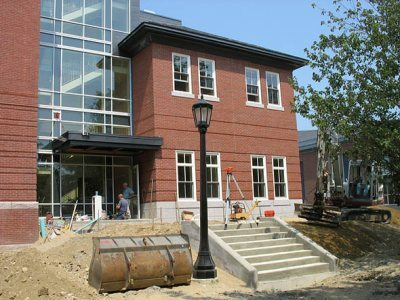 We began our reporting on the Hedge Hall and Roger Williams renovation with the arrival of the construction fence — and as the fence goes, so does Campus Construction Update, at least for now. Thanks for reading.